This home has 4 bedrooms, 5 bathrooms, private and guest parlors, dining room, kitchen, large, covered porches, patio, and 5 off street parking spaces. It can be home for your large family or combined empty-nester home and income property – either, with no changes required. The Amanda Gish House is located in the quaint, small town of Elizabethtown, in Lancaster County, PA. The home was built in 1896 by Henry B. Gish and his wife Amanda. Tax records show the land was in the Gish family from 1864 until 1942. Since purchasing the house in 1990, Ann and Dave Royer have lovingly restored the exterior and interior back to its original splendor. Beginning in 2001, Ann and Dave began offering three spare bedrooms as the Amanda Gish House Bed and Breakfast Inn. The Royer’s retained a spacious one-bedroom owner’s quarters as their private living space. 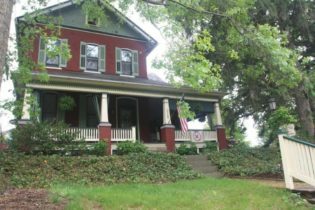 The Amanda Gish House is located on a substantial, fully shaded and attractively landscaped lot on the edge of Elizabethtown Borough with adjacent residential homes. Downtown Elizabethtown with its shops, coffee shops, restaurants and taprooms is within easy walking distance. Elizabethtown College is only a few blocks from Downtown, also within walking distance from the B&B. One of the largest and most highly regarded retirement villages in Pennsylvania – Masonic Village, is located just across Bainbridge Street. Elizabethtown is served by Amtrak’s Keystone line offering 13 trips per day to & from Harrisburg, Lancaster, Philadelphia and New York. The Amtrak Station is also an easy walk from the Amanda Gish House. 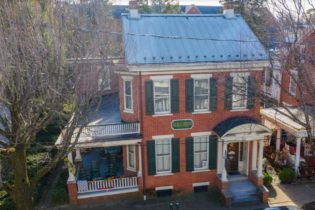 Welcome to 62 E Main Street, an 1850 Federal style property currently functioning and thriving as a full-service Bed and Breakfast, located in the Historic District of Lititz. Set in a prime location close to local shopping, dining, and entertainment, this dwelling is difficult to miss with its long and well-known history, brick exterior, oversized covered front porch, and elegant designs throughout. The interior offers historic charm with the convenience of modern features and appliances. Recently, the property has been restored with numerous updates and improvements such as: new HVAC, new roofs on the Carriage House and side porch, central vacuum, and a new stove and dishwasher. Each room is spacious, cozy, has its own unique appeal, and a private bath. As you enter the foyer, there is a spacious bedroom with large windows that not only let in lots of natural light, but also provides a great view of the street. Past the grand staircase, the welcoming hallway opens into the dining area which features hardwood flooring and access to the patio area. The kitchen is fully equipped with a granite top center island, an abundance of cabinet space, and a pantry closet; plus stainless steel appliances including a Jenn-Aire griddle and stove with center downdraft built into the island, a refrigerator, and dishwasher. Tile backsplash, custom lights above the island, and an exhaust above the electric cooking range add to an already amazing kitchen. Adjacent the kitchen is a sitting room with high ceilings and a private bath. The last room on the 1st floor is another bedroom at the rear of the building with its own sitting area as well as a full bath. The upper level contains 4 bedrooms, each with its own private bath. One bedroom has access to a loft area with storage and a full bath that could also be used as a sleeping area. The lower level contains lots of storage areas, a utility sink, upright freezer, a fast washer and 2 dryers. The exterior of the property is an eye-catcher with pristine landscaping, beautiful patio, balcony with spiral staircase, as well as private parking for approximately 10 cars. The back of the property also contains a Carriage House that boasts a large L shaped bedroom/sitting area, full bath, bar sink with mini fridge and an upper level loft storage area. The Inn is just a short commute to Downtown Lancaster, The Shoppes at Belmont, and the Lancaster Airport. Plus, it is convenient to tourist destinations such as Amish Lancaster County, Dutch Wonderland, Rockvale Outlet, Tanger Outlet, The American Music Theater, and much more!